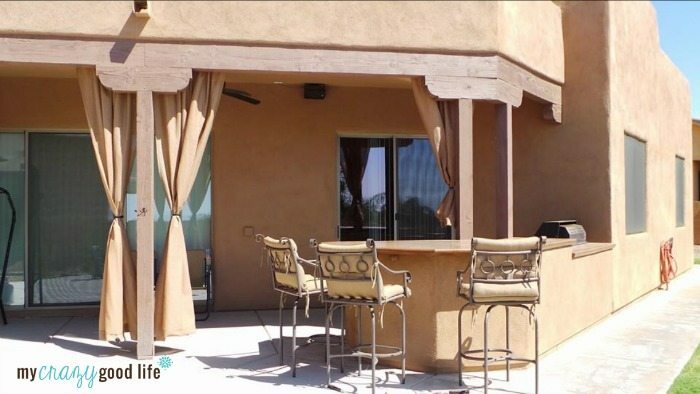 We recently made outdoor curtains for our back patio, and they have made such a difference in the amount of heat that comes into our west-facing home. Closing these right before the sun begins to set can keep our home cool and allow us to be out on the patio during that time (without roasting!). 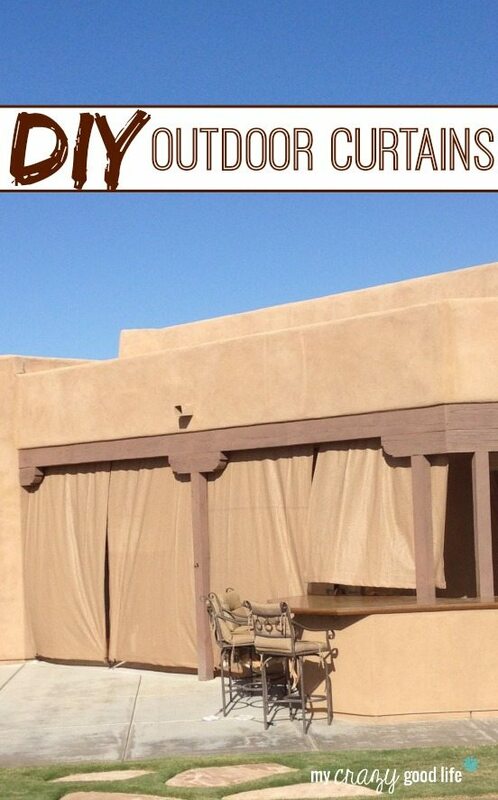 These DIY outdoor curtains were easier than I had thought, and I wanted to share with you how we did it! 1. Cut your metal conduit. We have 12-foot wide openings between our wood beams, so we used 2 6-foot sections of conduit with a conduit fitting and rod in between to stabilize. 2. Spray paint the conduit and fittings. 3. 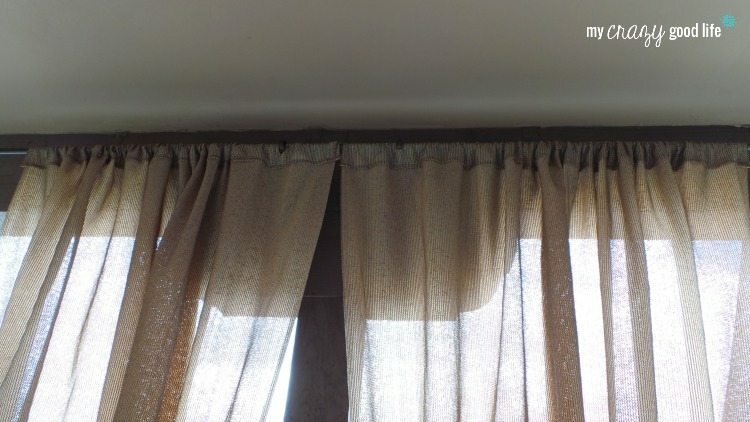 Measure for curtains. How big is your opening? 4. Hang the curtain rods. 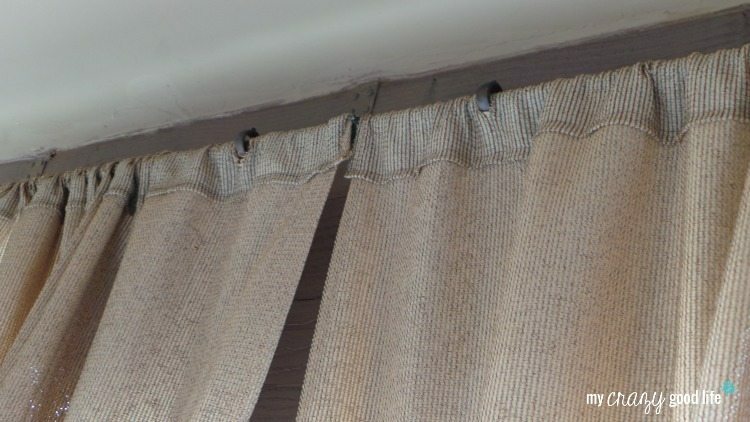 We used these closed curtain rod hangers to minimize the risk of the rod being jarred and popping out of the hanger–it’s windy where we live. You could use open hangers. 5. Cut the fabric. We cut our fabric to be 3-inches taller on top (to make the rod opening about 3-inches) and 9-inches longer on the bottom (to allow for fabric to be folded over and be strong enough for the plastic grommets). If we were to make these again we would make the top opening at least 5-inches so it’s easier to open and close the curtains. 6. Hem the fabric. Definitely the most time consuming part–especially for those of us who don’t sew! Use a thick hem on the bottom (we did 3-inches, folded over 3 times) so the plastic grommets have a strong bulk of fabric to connect to. Each of our panels are 6-feet wide. 8. Place your concrete anchors. We drilled a hole in the concrete and then used hammerset nails secure the anchors into our patio. 9. 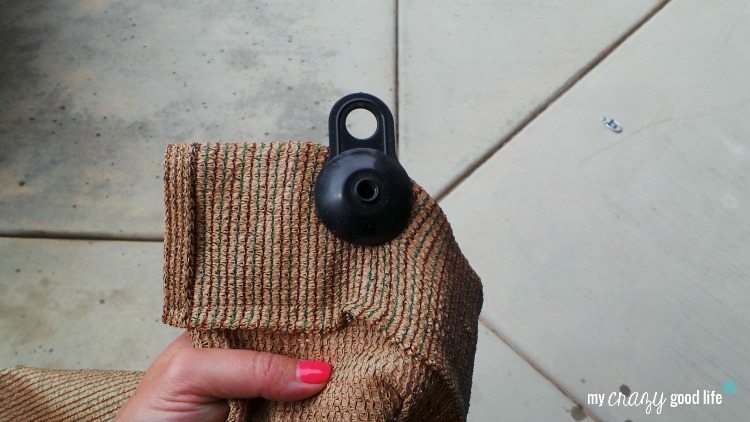 Attach your plastic grommets, making sure they are secured through 2-3 layers of fabric. 10. Fasten your curtains. 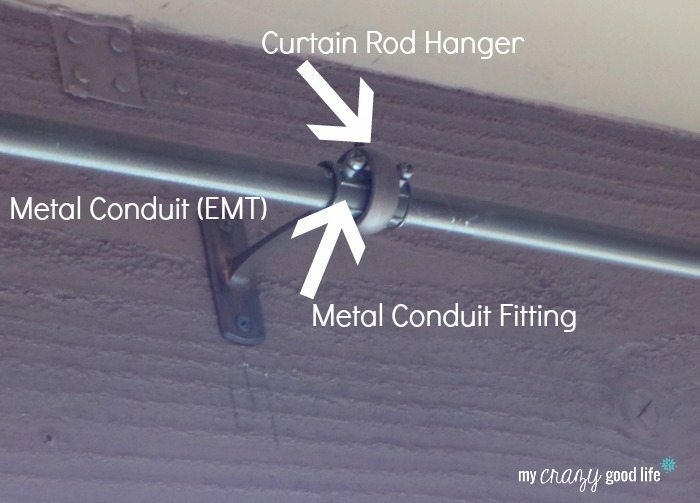 Use your bungee balls or another fastener to secure your curtains to the ground. 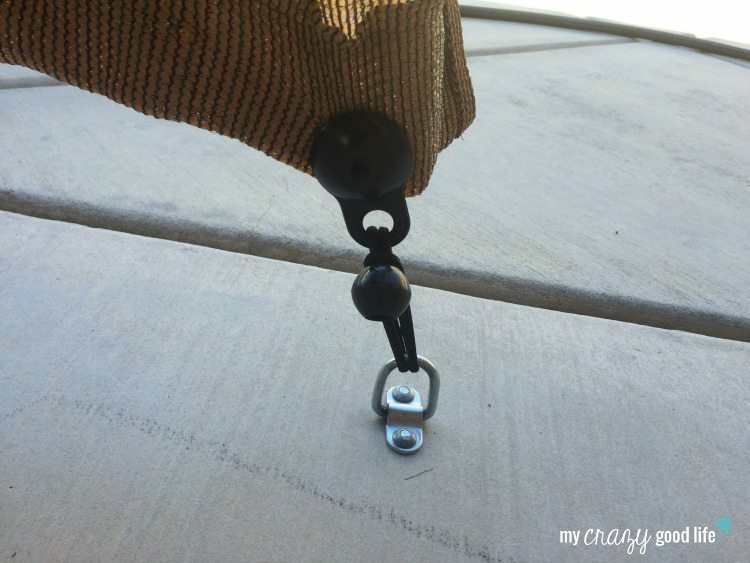 We love the bungee balls because when the curtains are open, they double as tie-backs. Previous Post: « Energy Drinks and Teens: Which Drinks Are The Worst? 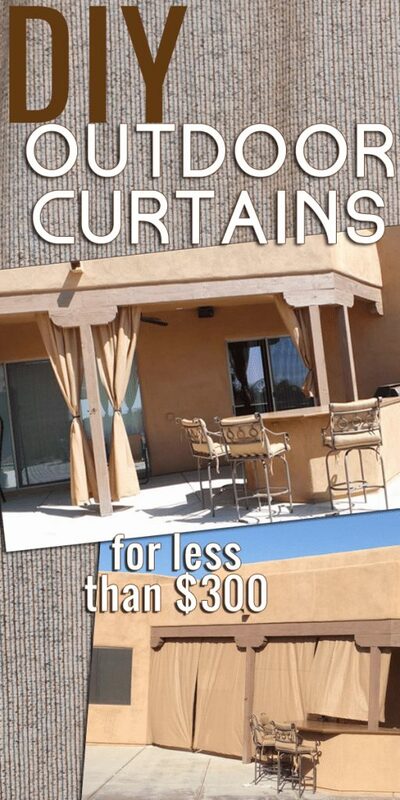 Thanks so much for sharing your DIY for Outdoor Curtains with Foodie Friends Friday party this weekend. It’s a great tutorial. 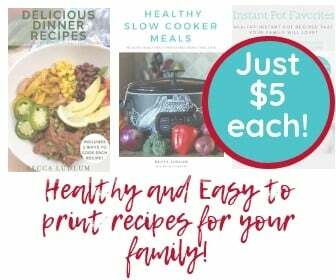 I’ve pinned and shared this weekend. Do you have any problems with this material mildewing when it gets wet? Jessie, it’s very dry in Tucson. That being said, we put these up during the middle of our monsoon season and have had no issues thus far. I’d assume if you don’t keep them pulled back and bunched than you’ll be ok! entire career if I hadn’t come across the website. this. I am able to now look ahead to my future. Thanks so much for this impressive and results-oriented help. I will not be reluctant to propose the blog to any person who should receive assistance about this matter. Hi Rebecca. Thanks for the tutorial. Sounds like a great plan to keep sun out. Wonder if fabric glue or a glue stick could be used for hemming the bottom. That’s a lot of sewing at the bottom for those of of us lacking sewing machine. Going to give it a try. Thank u.